Southwestern Oklahoma State University’s 2017 freshman class recently gathered for mass orientation and took time for a class photo on the Weatherford campus. 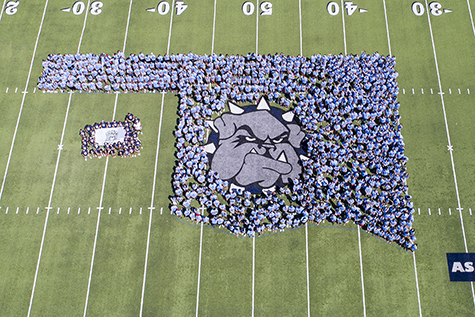 The SWOSU freshman class numbers 1,003, an increase of 4.2 percent from 2016. 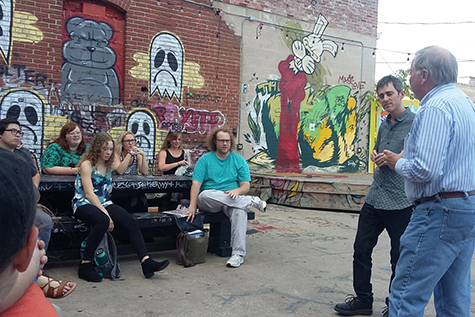 Oklahoma writer and historian John Wooley, far right, and Dr. David Gray, visiting assistant professor of American studies, lead a discussion on Tulsa history at a local venue during Gray's Tulsa Public Cultures course last fall. 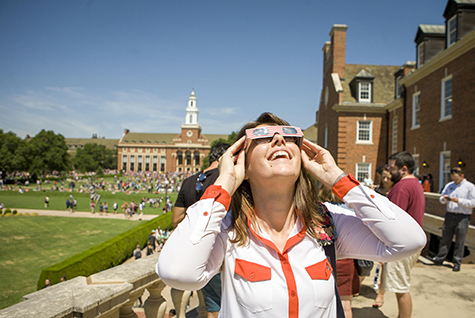 Britney Man, student at Oklahoma State University, looks through her viewing glasses during the solar eclipse on Aug. 21. The university hosted a viewing party on Library Lawn to celebrate the eclipse and the first day of classes. The Edmon Low Library provided viewing glasses and a projection of the eclipse was displayed through a telescope. The event was also live streamed on OState.TV.